1 ‘Journey in sound’ = climbing the pyramid (recorded in situ at Teotihuacan) - outer and inner journey. The sound paper mirrors the process of its own production. There is a distinct concretist/poetic inspiration; the structuring of the sound paper is the recording of an actual climb up and down the Pyramid of the Sun at Teotihuacan. And this climb also ‘takes place’ in the audio editor (see image below). 2 ‘Archaeology of sound’ - analyzing the materiality of sound (recorded in Condesa, airports and at Teotihuacan). 3 ‘Machine Raum’ = academic argument and discussion (recorded in Condesa, machine noises in background). Including Sound as evidence / the matter of fact / infrastructures. A different metaphysics is introduced: beyond dualisms. STS approach - transdisciplinary. Ignoring difference between social and non-social, ignoring outcome of previous work, ignoring the apparently ‘self-evident’ border between a scientific and non-scientific World. NO correct or false representations of nature. Scientific 'matters of FACT' (Latour). Scientific results appear as an intrinsic and understandable part of science in the making. Facts are like trains: they need their infrastructure (Latour). Sound as ‘evidence’ also points at the journey, the process of production, the transmitting network as a new structuring schematics for the humanities. 4 ‘Noise’ as (and distraction from) materiality is a (discursive and aesthetic) sound element throughout the audio paper. As such, it is intended as a heterotopian work. The audio paper builds on attempts to analyse the materiality in-between the schema of the pyramid and the network. It uses the performativity (and agency) of the researcher, the technics and processes of recording, and the indeterminate localities of sound evidence, to suggest a different pragmatics for academic methodology. Thalés, à l'ombre des Pyramides, fit se lever la géométrie légère et douce de leurs millions de tonnes . [Thales, in the shadow of the Pyramids, caused the light and soft geometry of the millions of tons of stone to rise]. L’arrivée des nouvelles technologies a changé le schéma. Un schéma en réseau, ce n’est plus un schéma en pyramide. C’est autant de récepteurs que d’émetteurs. Tout le monde émet, et tout le monde reçoit. Cela change tout. The French philosopher Michel Serres uses the pyramid to point out a diagram, or rather schema, which, together with the network (‘la reseau’), functions as the key figures in his philosophical/poetical method. Throughout his writings, he develops a certain ‘hyperbolic thinking’ (imagining, imaging), in which the diagram/schema (of the Pyramid and the network) as analytical tool is key. The pyramid and its shadow are signs of an obsolete analytical method, whereas the network is the diagrammatic schema of new technologies. Thus, he argues, the whole game of understanding is transformed from being based on implied receptors (reception is navigating according to the schema of the Pyramid) to implied producers (or transmitters – navigating according to the schema of the Network). La géométrie est une ruse, elle fait un détour, elle prend une route indirecte pour accéder à ce qui dépasse la pratique immédiate. La ruse, ici, c'est le modèle : construire en réduction. À module constant, un résumé, un squelette de pyramide. De fait, Thalès n'a rien découvert d'autre que la possibilité de la réduction, que l'idée de module, que la notion de modèle. La pyramide est inaccessible, il invente l'échelle. The schematics of the network points us in the direction of how we may analyse the world in the age of technogenesis (as Katherine Hayles names it). Origo is both a point of origin and originality, the point through which everything must pass – materiality and imagination – and thus is the point zero of a ‘double structuring’ that Serres claims informs all our thinking about materiality and the existence of things. Origo is a logical and existential ‘zero point’, a place of synthesis of matter and ideas, objects and humans; and the interlacing of the ‘geometrical’ and antiquated paradigm of the pyramid with the present paradigm of the network. Origo is the conceptual idea structuring the audio paper’s presentation of academic argument as well as its poetic method. Technically: An Edirol stereo recorder was used for all recordings. There are no synthetic sounds or samples involved; all used sounds are based on recordings made during the trip to Mexico. Audacity was used for editing. 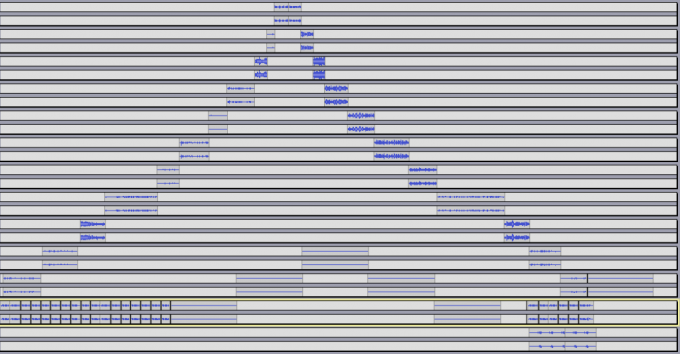 In the editing process, I constructed the audio paper as a pyramid in sound (see below) – as a concrete visual and auditory poetic structuring of Origo. Fig. 1. Screenshot of the basic concrete ‘poetic’ structuring of the audio paper Origo as a ‘pyramid’ schema. The final result integrated more elements and a few more layers, but the basic structure remained almost intact. Cox, G. (2016) Ways of Machine Seeing. The Photographers Gallery, London. [Online]. Available from: http://unthinking.photography/themes/machine-vision/ways-of-machine-seeing, [accessed 29. november 2016]. Hayles, K. (2012) How We Think - Digitial Media and Contemporary Technogenesis. Chicago: University of Chicago Press. Parikka, J. (2015) A Geology of Media. Minnesota: University of Minnesota Press. Pickering, A. (1995) The mangle of practice : time, agency, and science. Chicago: University of Chicago Press. Serres, M. (1982) La Communication. Paris: Gallimard. Serres, M. (1984) La Traduction. Paris: Gallimard. Serres, M. (1986) Statues. Paris: Gallimard. Serres, M. (2015) "Ce n’est pas avec la trouille qu’on invente". Europe 1, Paris. [Online]. Available from: http://www.lejdd.fr/Societe/Michel-Serres-ce-n-est-pas-avec-la-trouille-qu-on-invente-732636, [accessed 29. November 2016]. Tufte, R. (2001) The Visual Display of Quantitative Information .Connecticut: Graphics press, Connecticut. Morten Søndergaard is a curator, art critic, theoretician, and associate professor of interactive media art at the School of Communication, Art and Technology at University of Aalborg (based in Copenhagen). He is the international co-coordinator of the Erasmus Master in Media Arts Cultures and on the faculty of the Media Art Histories Master at Blue Danube University in Krems. As head of research of the research-infrastructure project Unheard Avant-gardes in Scandinavia (since 2010), he curated a section of the Sound Art – Sound as Medium of Art at ZKM; and founded the International Sound Art Curating Conference Series (ISACS), both in 2012. Formerly, he was the Curator of the Museum of Contemporary Art in Roskilde (1998–2008) (Constituted Director 2003 and 2006-07), and the senior curator at Re-new Digital Arts Festival in Copenhagen (2010–2013); chair of Design Cases at Nordichi (2012) and exhibition chair at NIME conference 2017. Member of the curator-board at DIAS artspace in Copenhagen (since 2012); contributing editor of Leonardo Electronic Almanac (2011–2014). He has published and edited widely on the topics of media art, sound art, and the electronic archiving experience, and he has curated and co-curated numerous international exhibitions since 1994; in 2017 he co-curated the exhibition ‘Roads less taken…’ at Ars Electronica with students from Art & Technology BA and Media Arts Cultures Erasmus Master.